DATEL, Inc. announces the ADC-85 Series of Analog-to-Digital converters, which are 12-bit, 8ï¿½s conversion time ADCs housed in a hermetically sealed 32-pin side-brazed DDIP or gull-wing SMT ceramic package. Each unit features guaranteed ½ LSB of linearity and is 100 percent tested for performance across one of three specified temperature ranges: 0 to +70°C; -40 to +100°C; and -55 to +125°C. The ADC-85 has five analog input ranges and offers parallel and serial digital outputs. It can be short-cycled to give faster conversions in lower-resolution applications. Other key benefits include an internal buffer amplifier provided for applications in which high input impedance is required. Output coding is complementary binary, complementary offset binary, or complementary two & 1/2 complement. With excellent Differential and Integral Non-linearity specifications, the ADC-85 has been an industry standard family of data converters and is a good choice where precision and accuracy are required. The device is available in commercial as well as military/high-reliability temperature versions, and is pin-for-pin compatible with the ADC84, ADC85, MNADC87, HSADC85, and MNADC85 series. Both 883 and DSCC/DLA-compliant models are included in this family and are available under drawing number 5962-8850802XC for gold pins and 5962-8850802XA for solder-dipped pins. RoHS and non-RoHS versions are available. 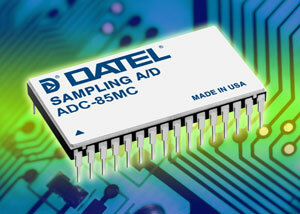 The ADC-85 series is manufactured in DATEL's USA facility which is certified to MIL-PRF-38534 standards.